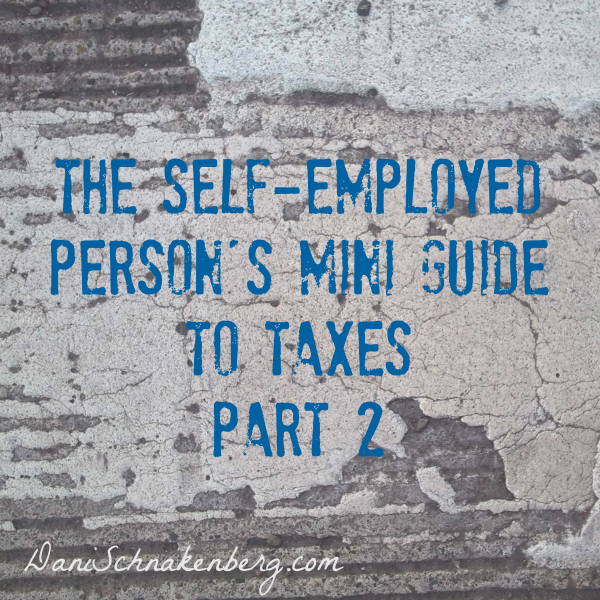 Once again we’re chatting with Katie Marcum from KatieMarcum.com about the specifics of taxes for the self-employed. I think the expense part of the Schedule C is one of the most daunting for many of my clients. What can you deduct? What can’t you deduct? Why will one tax pro let me deduct something that another one wouldn’t? We will discuss in Part 3 what to look for in a tax preparer and/or a tax preparation company. The first rule of expenses on the Schedule C is to remember that you are required to deduct any and all expenses that you incur in business. That may sound odd to hear, but the bottom line of your Schedule C affects your entire tax return. With that being said, if you underreport your expenses, thus making your income higher than what it actually was, you could potentially qualify for a higher amount of Earned Income Credit. Earned Income Credit (or EIC) is one of the biggest tax credits available on the tax return, making it the most sought after credit. Because its the most sought after credit, its the one that’s been under the most scrutiny by the IRS. If you are found to be misrepresenting your income or expenses in order to qualify for a higher EIC, it could mean BIG tax penalties for both you and your tax preparer. Not worth it in my opinion! What can I deduct? What can I not deduct? The question, ‘what expenses are deductible’ is a very big question. It all depends on the type of work that you do. I recommend sitting down with a tax professional to talk about the types of expenses you might incur in your business and whether or not they are deductible. You can also check out the list for yourself in Publication 334. Personal expenses are NEVER deductible! That’s one thing that the IRS is very clear about. Personal deductions/expenses go on Schedule A (the types of deductions allowed there are limited), they are never allowed on the Schedule C. This is true whether you market skin care products, vitamins or insurance. You cannot deduct the cost of the products or supplies if they are a personal, family or living expense. “But what if I sell clothing and I need to wear the latest fashions?” Great! You get to wear great clothes. It doesn’t make them deductible. “But what if I joined a business and my welcome kit included business brochures, information, tools and products? Can I deduct the cost of my kit?” Well that depends. What will you be doing with those products? Are you going to use them personally? If so, they aren’t deductible, which makes only the business part of your kit a deduction. Here is another ‘hot topic’ with the IRS. Business use of home. Many people do part of their work from home, but only certain people are allowed to deduct part of their home expenses on their business return. With the exception of the area you use for inventory or daycare, in order to be able to deduct your office, it needs to be used EXCLUSIVELY for business. You should not use your office for personal reasons at any time. For example: if your office consists of your computer, desk, printer and a guest bed….its doesn’t pass the exclusive test. Another one: while the kiddos are in bed your office is your office. That’s where you are doing your blogging, ordering, marketing, or whatever else you do. But during the day, the kids are using the office to do their homeschooling, watching movies and playing games. Its not a deductible office. In addition to the exclusive test, your office needs to also pass the ‘regular use’ test. Say you have an office set up in your home, but you’d rather work while sitting on a blanket under the tree outside or downtown at the coffee shop. Even though you’ve got a wonderful office set up, if you aren’t using it, its not deductible. I once heard someone say “I get to deduct a huge portion of my home expenses for business”. Here’s my reply to that…. Let’s say you are using your office regularly and exclusively for business. Great! Now we get to calculate how much of your home you are using for business. Lets say you house is 2100 square feet and your office is 10×10. That means only 4.8% of your home is used for business. Less than 5% of your mortgage interest, taxes, repairs and utilities can be used as a deduction, I’m not seeing how that’s really a ‘huge’ portion. Yes, its great to be able to deduct it, but it’s not something to get overly excited over. Starting with the 2013 tax returns, you may now choose the ‘optional’ method of calculating your home office expense. Please talk to your tax advisor to determine if this method is best for you. Join us tonight (Tuesday January 14th) for a live webinar. I’ll be available afterwards for a question and answer session. Register HERE.